With the "Newsletter" module you can comprehensively and professionally manage your DEM (direct e-mail marketing) campaigns: even though it is designed as an add-on within the content management system, this module is as functional and powerful as purpose-built software. Indeed, some of its features are unique and can't be found on other platforms. Composing messages to be sent as part of a DEM (direct e-mail marketing) campaign is very easy and intuitive because it is done with the visual editor. As you can guess from the image, the text not only contains any formatted text you may wish to add, but can also be made "dynamic" for recipients: you can add effects such as "Hello" [# NAME #] and [# SURNAME #]", where [# NAME #] e [# SURNAME #] are replaced with values extracted from the list of recipients. You can send your newsletter to a list of recipients contained in your data tables (Dyn-Table), or add filters to extract portions of it. In the example shown in the image, the newsletter is to be sent to data table "Newsletter", but only to those among its list of recipients who have "@megaitaliamedia" as part of their email field. Naturally, multiple filters can be simultaneously applied, regardless of field type (text, date, number, etc.). After distribution, you can thoroughly keep track of a newsletter's performance: you can get stats on how many have read it (and when), how many have clicked on what, and more. The image shows the "Stats" windows of two different newsletter: the top-right one is using the "General stats" tab with a graph of the newsletter's general performance; the bottom-left one is displaying the "Page analysis" tab which shows the newsletter with a lable beside each link showing how many users have clicked on it. Stats can be analysed in more detail: for instance, you can check a single user's history - namely how many newsletters he/she has received, how many he/she has read, how many and which specific pages have received clicks, etc. It is worth noting that the CMS automatically "attaches" Google Analytics-related parameters to every link of your newsletter: these will enable you to check your newsletters' performance as campaign. One of the most advanced features of the "Newsletter" module is certainly survey management. You can create any number of surveys with either open or close-ended questions. 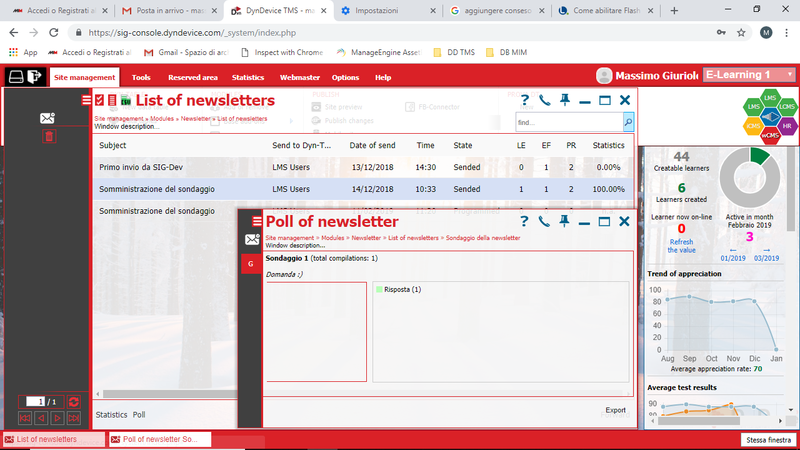 The distribution of these surveys is carried out via newsletter, so recipients are able to answer the questios directly from the email or webmail client. As you can see from the image on the side, an advanced stats system is also available on this feature.